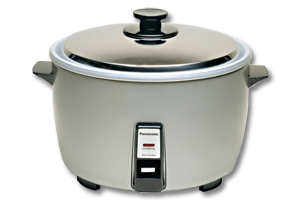 Introducing the SR-42HZP Commercial Electric Rice Cooker. With its large capacity, it cooks from 5 to 23 cups in approximately 30 minutes, with a serving capability of up to 80 three-ounce portions. This NSF- and UL Commercial-listed Rice Cooker is engineered with push-button operation, a built-in thermostat for precision control, and a direct heating system–resulting in rice that is cooked easily, safely, and effectively.